Test 2019. Candidates who are completed intermediate/10+2 they can apply for UG Courses and who qualified degree in the pattern of 10+2+3 or in 12+3 or in 11+1+3 they are eligible for regular UG/PG Courses. Written exam for this CUCET 2019 will be conducted from 13-05-2019 to 16-05-2019. 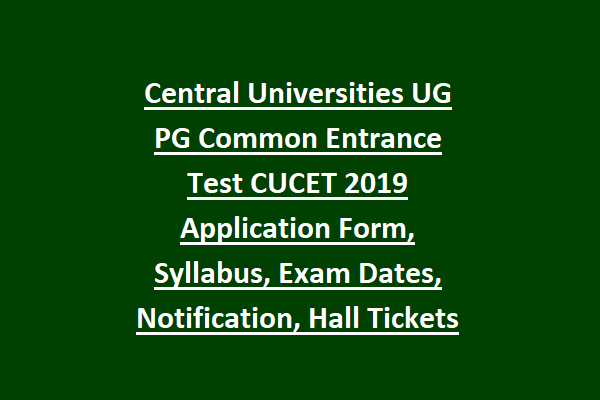 CUCET 2019 Hall Tickets, Exam pattern, CUCET Counseling dates and other related information about this Central Universities UG/PG Common Entrance Test 2019 is updated below. For M.Phil, Ph.D Courses-PG qualified candidates are eligible to apply. The application fee for International applicant is Rs. 3500/-. Written Exam will be conducted on 25-05-2019 & 26-05-2019 in various sessions. Written exam will be conducted for 100 Marks and consists of two parts. Part A syllabus topics are English Language, general awareness, mathematical aptitude and analytical skills. Part B is subject related section total 75 MCQ's will be given. There is a negative marking for this CUCET Exam. For each wrong answer 0.25 mark will be deducted. CUCET 2019 Hall Tickets will be available 10 days before the exam date. 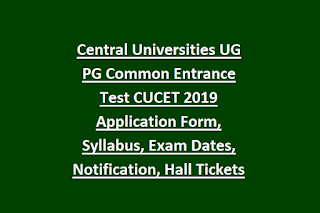 Candidates who are interested to study with Degree or Post Graduation or M.Phil or Ph.D in Central universities they can apply online for this CUCET Exam 2019 on or before 13-04-2019.